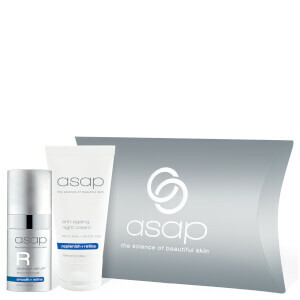 The perfect cleanser for everyday use, the Asap Daily Facial Cleanser is soft and non-drying on the skin. If your skin is sensitive, easily irritated or prone to breakouts, don't fear; this is the cleanser for you. It won't tug on your skin as you cleanse and won't cause breakouts. No more dryness, no more excess oil, your skin will be soft, refined and more youthful looking. It's crucial to cleanse every day, morning and night, but some cleansers can be too powerful, stripping away the skins essential oils leading to dry or excessively oily skin that is more prone to breakouts. 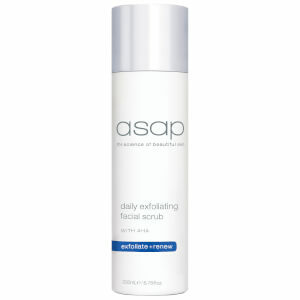 Asap Daily Facial Cleanser removes traces of makeup, evens skin and smells really good too! Made with key ingredients Glycolic Acid for protection against free radical damage and White Tea, an antioxidant with anti-ageing properties. No matter your skin type; dry, oily, combo, normal, your skin will thank you for cleansing with asap Daily Facial Cleanser. You only need a pea sized amount so this 200ml bottle is really good value for money - it will last you for months! Stock up now. Proudly Australian made and owned, try asap today for beautiful looking skin. Apply twice daily to wet skin. Massage gently for 30 seconds and rinse thoroughly. Xanthan Gum, Vanilla Planifolia Fruit Extract, Sorbitol, Sodium Hydroxide, Sodium Glycolate, Phenoxyethanol, Magnesium Aluminum Silicate, Laureth-4, Glycolic Acid, Glycol Distearate, Ethylhexylglycerin, Cocamidopropyl Betaine, Cetearyl Alcohol, Camellia Sinensis (White Tea) Leaf Extract, Aqua (Water), Ammonium Lauryl Sulfate. I found this cleanser to have a really soapy feel about it. My skin was tight and dry after using. My skin is combination, I don't have a problem with dryness usually, but this cleanser dried it out completely. This is a staple product to have in the bathroom! Perfect for skin types and my partner will even use the product too. The best cleanser around and love that it's free shipping too! I use this cleanser at night and am really happy with my skin afterwards. It feels clean yet not stripped of natural moisture. My skin is generally on the dry side. Do yourself a favour! It's a winner. The most fantastic cleanser I have ever used. My skin glows after using it morning and night. There is no tightness after cleansing. I have very sensitive skin and this cleanser is so gentle that there is no irritation whatsoever. I've suffered Rosacea in the past but I get no redness or dryness with this product. I can't recommend it enough. Great cleanser and exfoliator in one without feeling gritty. Makes my mature aged skin feel soft and clean without being drying. It also suits my teenage daughter's acne prone skin. Prepares it perfectly for the other ASAP skin products. I have been using it now for a number of years and wont use anything else to cleanse my face.